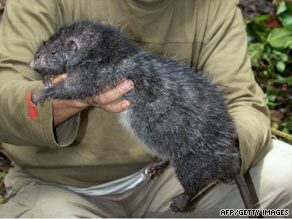 Good news out of Papua New Guinea: several new species of various types have all been discovered. And you thought animals were only dying off, not being found. Think again. I know what you’re thinking: Yes, seeing that rat would be nice in theory, but I bet they scurry away when they come upon humans. Think again, friend. “The animals inside this crater were unafraid of humans, pretty much because they hadn’t seen them very much,” McGavin said. The simple wins in life.